A palatable yucca flavored vitamin-iron-mineral feed supplement for horses formulated to provide supplemental vitamins and minerals that may be lacking or are in insufficient quantities in a horse’s regular feed. Homogenized for maximum consistency. 1 scoop is equivalent to 2 oz of Red Cell® Liquid. Horses in training: Feed 1 oz of Red Cell® Pellets supplement daily by mixing into daily feed ration. 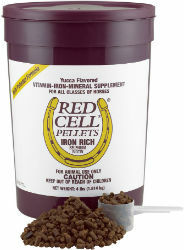 Horses not in training: Feed 1/2 oz of Red Cell® Pellets supplement daily by mixing into daily feed ration. Store in an area inaccessible to children or animals. Flaxseed meal, dehydrated alfalfa meal, wheat middlings, vitamin A supplement, vitamin D3 supplement, vitamin E supplement, menadione sodium bisulfite complex, vitamin B12 supplement, riboflavin, pyridoxine hydrochloride, folic acid, biotin, thiamine mononitrate, choline chloride, calcium pantothenate, calcium carbonate, calcium sulfate, ferric ammonium citrate, copper sulfate, magnesium sulfate, zinc sulfate, sulfur, manganese sulfate, ethylenediamine dihydriodide, cobalt sulfate, potassium chloride, potassium sulfate, sodium selenite, yucca schidigera extract, mineral oil, lignin sulfonate.